Upon taking office as President of the General Assembly on 13 September 2016, I dedicated the 71st session of the General Assembly to push for the implementation of the 17 Sustainable Development Goals, in order to keep faith with the promise we all made to transform our world for the better through the 2030 Agenda. I also undertook to be accountable to you at the end of the 71st session as to how we fared. It is for this reason that we have called today’s meeting. I hope our gathering today will provide a useful opportunity for reflection on progress on this year’s work, on lessons learned, and enable an exchange of views on the state of play of SDG Implementation. I say again, that taken together, the 2030 Agenda for Sustainable Development and the Paris Agreement on Climate Change, provide humanity with a masterplan for a sustainable way of life on this planet. In order to keep the SDGs at the top of the global agenda, my office travelled to 32 countries across every region of the world. This was a time-consuming exercise, and I particularly want to thank Ambassadors Kamau and Williams for putting in the hard yards attained. From COP22 in Morocco to Habitat III in Ecuador; from the World Bank Spring Meetings in Washington to the World Economic Forum in Switzerland and the OECD in France; from the African Union in Ethiopia to the European Union in Belgium, to the Belt and Road Forum in China and to the SIDS Symposium in the Bahamas, we were present at the forefront. We visited the UN Offices in Bangkok, Nairobi, Vienna, Rome and Geneva to convene with them on the Sustainable Development Goals. On each occasion, we drove home our key 2030 Agenda messages, urging all actors to get on board the SDG train, to get the wheels of implementation turning, and to join the journey to a better world by 2030. During the 71st session, we placed particular focus on engaging young people, believing them to be the most effective agents of transformation given the importance of the 2030 Agenda to their lives. We met with groups of young people at every given opportunity and I wrote to every Head of State and Government encouraging them to incorporate the SDGs into national school curricula, making a similar request to the heads of over 4,000 universities. 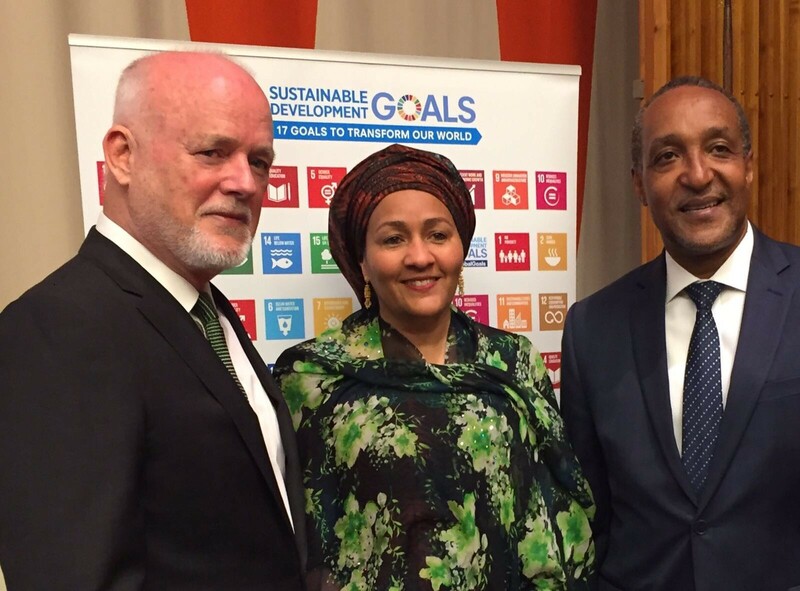 In addition, we strove to bring the attention of the global public to the SDGs. As part of this effort, we organized a series of SDG Media Zones to allow the global social media community to engage with leaders and speakers at the High Level Week in September and other High Level Meetings. All this to burn the candle of enlightenment better and brighter. Headway is being made in many key areas, as captured in this year’s UN SDG Progress Report. Governments have made great strides in incorporating the SDGs into their national development plans, as was further evidenced by the strong interest in voluntary national reviews at this year’s HLPF. Meanwhile it is heartening to see the business sector becoming increasingly aware of the SDGs and expressing a desire to play an active part in their implementation. Progressive actors in the financial world see that the future is green and that the 2030 Agenda presents incredible investment opportunities. I want to thank you, the Member States, for your support and good advice throughout. For those among you who at my request took on onerous roles of facilitation and chairmanship, I applaud you here in front of your peers. I congratulate the Secretary-General and Deputy Secretary-General for grasping the baton of responsibility and leadership without breaking stride. I thank UN DESA and many other parts of the Secretariat, especially those in the field in the service of the UN system, for putting their shoulders to the wheel; likewise, the wonderful team at the Office of the President of the General Assembly for doing all that was possible to keep us moving forward on the 2030 Agenda. As you begin your preparations for the High-level week of the 72nd session, I urge you to give this message to your capitals: we have achieved momentum on the SDGs, but there can be no rest. To get to the promise of the 2030 Agenda, we now need a shift in gears. It is time to crank it up a notch, for time is not on our side. We have the resources, the ideas, the technology and the motivation. Add leadership, courage and an unwavering commitment to progress and we will reach our 2030 destination with goals fulfilled. As I have said many times, together we are strong. When it comes to the 2030 Agenda for Sustainable Development, we succeed or fail together, for we are addressing the sustainability of our planetary ecosystem, the integrity of our global economic system, and the equity of humanity. We will not fail because we love our grandchildren. We will succeed because we have not come this far only to be defeated by greed.